Ixiolirion are funnel-shaped flowers borne loosely on the stem. They flower best after hot, dry dormant periods in the summer. Grow them at the base of a sunny wall or in a raised bed. Good for naturalizing and for cut flowers. 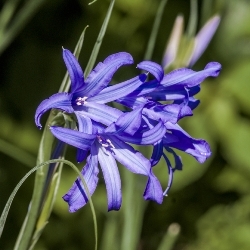 Ixiolirion Tataricum has miniature lily-like sky blue flowers with darker midveins. It will multiply rapidly, but it needs a warm, well-draining spot and arid summers. Also known as ‘Lily of the Altai’ or ‘Lavender Mountain Lily’.